Window Bowl Online Store - karinabromaitiss jimdo page! Window Bowls are so much more than decorative items. As one customer put it, “it’s like holding the sun in my hands”. Light is so important to us. A cloudy day can bring us down and sunshine has us turning our faces to the sky. These bowls seem to radiate light. It is the light that draws us in to them. And what about our own light, the light that radiates out from within us. Or the light that others shine on us, or our own light that is reflected back on us by others. All of it is about light, either literal or poetic, and real for us in any case. Poets, theologians-they all talk about the light. The light of understanding, the light of truth, the light at the end of the tunnel and how at the end we will walk toward the light and find peace. I find some peace in making these bowls in my studio. It is my wish that you find some peace in having them in your home. PROCESS: The stunning effect of these Window Bowls comes from a long and multi-stepped process. The bowls are thrown on a potter’s wheel and trimmed. At just the right moment of dryness, the windows are cut out of the bowl. The next step is to apply 6-8 coats of terra sigillatta and burnish. The bowls are then either packed in sawdust and a saggar for the jet black effect in my electric kiln, or packed with sawdust and other materials and pit-fired for a mottled finish. 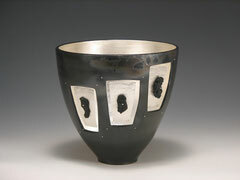 If the bowls survive to this point, they are then cleaned and primed for the application of metallic leafing (either copper or silver); the leafing is applied and then sealed. The final step is the creation of the “window dressing”. Natural organic and found objects, semi-precious stones, or small metal sculptures in copper or silver are suspended in the windows. The effect is luminous and magical: Vessels for the containment of light and beauty and peaceful contemplation. To view these pieces, please scroll down the menu on the left.